Mara Stoneware Dinner Cups - Sunflower are uplifting. 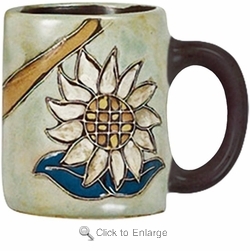 The unique placement of the sunflower by Mara on the stoneware dinnerware cup is so artfully done. This goes with Mara Dinnerware Set - Sunflowers. You can see all Sunflowers-Flowers-Trees theme designs here Sunflowers-Flowers-Trees. Approximate dimensions (l x w x h): 4.75" x 3.25" x 4"